Designing a kitchen is something most homeowners only do maybe once or twice in their lives. Because of this lack of knowledge and experience, there are a lot of mistakes they may make when planning their new kitchen. A functional kitchen is one that benefits with all of the appliances you could ever need to prepare snacks and meals for yourself, your loved ones and your guests over the next several years. To that end, it’s good to know what appliances you want in your new kitchen. Whether this is a sleek, smooth style multi function oven that’s large enough to cook for the troops or a smaller combined microwave oven. Some of our customers who love cooking want a 6 burner cooktop or equivalent induction cooktop. Others are happy with a cooktop with 4 burners. The size of these vary so your designer will want to know your preferences so a suitable space is allowed for your cooktop. In fact, when you book a Kitchen Design with us, why not speak to our Kitchen Designers about your appliance needs. We retail a range of quality brand names like IAG and Kleenmaid. Another important consideration is where your appliances are going to be placed. There is the classic “work triangle” which is a good guide when it comes to placing your refrigerator, dishwasher, and stove. But then there are other things to think about, like where the microwave is going to sit and where you’ll be placing your toaster oven or coffee maker. For example, one mistake we’ve come across time and time again is the microwave positioned in a right-hand corner. As homeowners quickly discover, putting a microwave there makes it too difficult and frustrating to open and access. A professional designer will be able to help you with all these needs. Before building your kitchen, make sure that the floor you want is in place. Installing flooring after the rest of the kitchen has been organised means that your appliances like your dishwasher won’t fit back into their positions, which will only lead to further frustration and expense. A small bin in the kitchen may look cute, but it’s far from functional. The kitchen is easily the room where the most waste will be created, so take some time considering what size bin will accommodate your kitchen waste and where it will be placed. A leading trend is for cupboards to have a “pull out” bin near the sink. This way you can easily get rid of unwanted waste while keeping it all nicely hidden away in your beautiful kitchen space. What may easily become the most expensive part of a kitchen is knocking down walls and moving services – especially when it’s not necessary. Professional Kitchen Designers like those who are a part of our design team at Zesta Kitchens come up with creative custom layout solutions, potentially saving you thousands of dollars. Best of all, we will give your kitchen that fresh, polished look that only discerning homeowners and superior designers can achieve together. Interested in learning more from the experienced kitchen company? 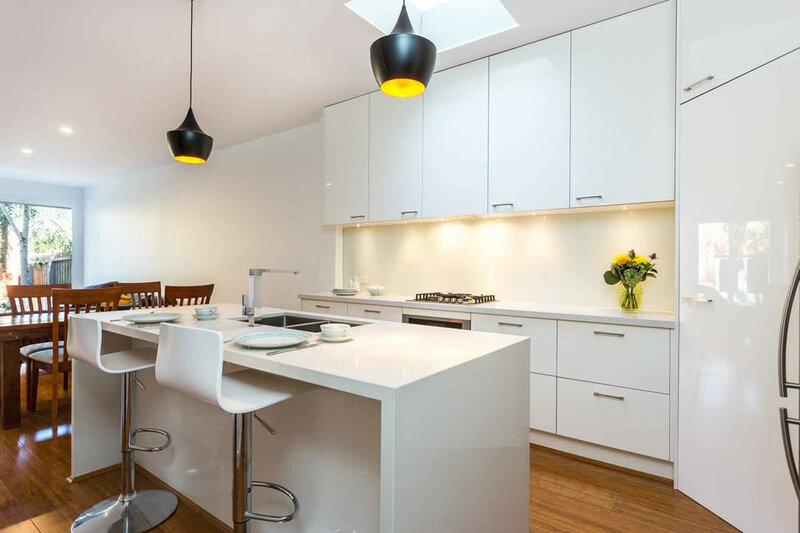 Book an in-home design with us online or pop into one of our showrooms so you can talk about your dream kitchen with an accomplished Kitchen Designer.